Welcome to Villa EXHALE, the finest residential resort property in Nusajaya. This Balinese inspired villa is made up of 6 separate pavilions, all interconnected via covered walkways and gardens. Located in the gated and guarded community of Ledang Heights, Iskandar, this dream home is just minutes from Marlborough College Malaysia and the Tuas bridge to Singapore. This luxury villa is 12,900 square feet in built-up area (10,400 sqft built-in area) and is nestled amidst 30,000 square feet of private, beautifully designed and manicured gardens. The estate features nature prominently, with open air spaces, Koi pond and water garden, private outdoor bathtub, and indoor/outdoor gardens. Designed by award winning architecture firm EXHALE, the home was made with the highest quality materials and craftsmanship. Teak, granite, marble, travertine and natural stone are used prominently. Vaulted ceilings with exposed timber and rattan are featured in the main spaces. 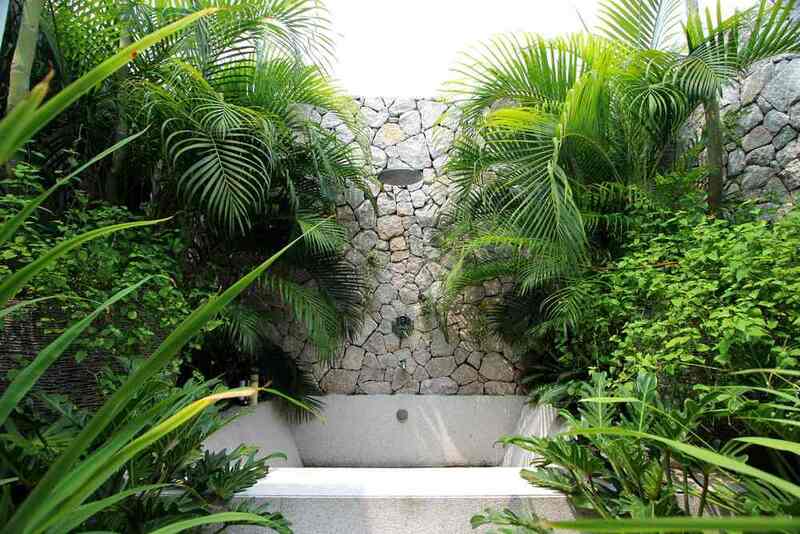 The washrooms boast Hansgrohe and Duravit sanitary wares, including an outdoor rainshower in the Master Bath. Solid Chengal doors with stainless steel locksets and windows with laminated anti-break glass are used throughout. To top it off, the designer kitchen comes complete with the best appliances by Miele, Gagennau and the like, fully integrated into real wood finish cabinetry with premium fittings. The social hub of the home, the Living Pavilion features a large open-air space with unique, vaulted rattan ceilings. Solid Chengal timber decking is used on the large verandah facing the pool and gardens while gorgeous travertine adorns the living and dining room floor. A beautiful Koi pond and water garden, complete with large potted fountains, surround the dining room with a stepping-stone bridge to the deck beyond. Your guests deserve a space all to themselves, and at Villa EXHALE they have their own pavilion to stay in! Located adjacent to the Main Living Pavilion, this private living space has easy access to the pool and social hub of the home. The pavilion includes a private foyer, tropical bathroom and two guest bedrooms. One of these includes large French doors that open out to the pool area and can make for a perfect home gym or a private room for guests. Another stunning place to entertain, or just relax, is the BBQ and pool area. The BBQ pavilion offers a beautiful view of the sunset and neighbouring greenery. A large 12 m infinity edge pool, comes complete with children's splash pool, pool-side traditional thatched alang-alang bale and toilet/shower area. A granite deck surrounds the entire pool, with handy cupboards to hide away all the pool toys. The deck is a fantastic spot to host parties, or simply to relax after a long week. For those who enjoy cooking, the residence comes complete with a gourmet kitchen which opens up to a private kitchen garden perfect for a herb garden. Custom cherry wood cabinetry with granite countertops have been designed with fully integrated top end appliances including a 90cm Miele oven, Miele Steam Oven, and Gaggenau 5 burner induction hob. Connected to the kitchen are the service and staff quarters. The only 2 storey structure, the family pavilion features French doors that open from every bedroom to the verandah and ample gardens, allowing beautiful airflow and access to nature. Teak floors are used throughout. The upper level houses the large master bedroom and library/study. Both feature vaulted ceilings with exposed timber rafters, with stunning views to the pool and gardens. The “his-and-hers” Master bathroom includes 2 shower areas, an indoor shower and a private outdoor garden area with bathtub and rain-shower. There is also a walkthrough wardrobe adjoining the master bath and master bedroom. The lower level houses 3 bedrooms and a playroom/family room, perfect for children. This level includes one common washroom with shower, bathtub, 2 sinks and toilet. One of the bedrooms features an ensuite washroom with shower. 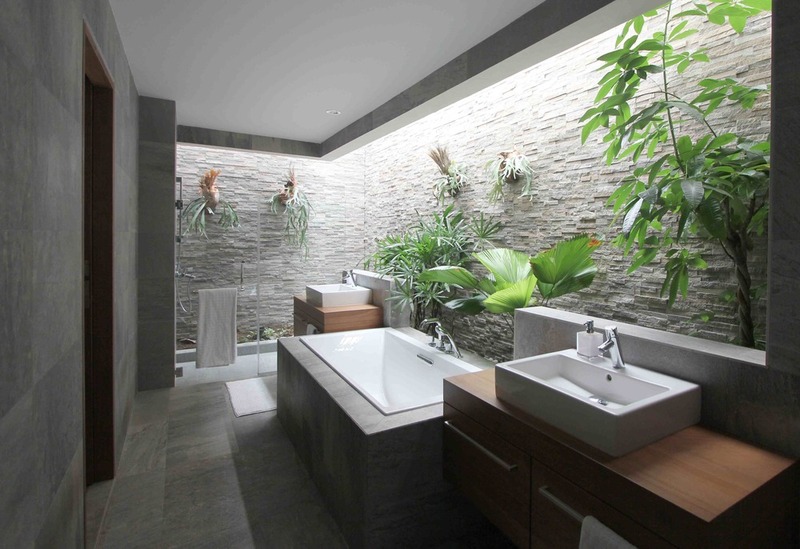 Both washrooms feature stonewalls, indoor gardens with light well, and custom wood cabinetry. Premium finishes, lots of light and thoughtful design give the indoor spaces as much airiness as the outdoor spaces. The entire estate is immaculately landscaped, and has been regularly maintained. The front and backs of the house offer meandering trails allowing one to stroll and admire the many flora an fauna within the gardens. In case it’s even more nature you want, the rear gate opens directly to a public trail which leads to the parks and lake of Ledang Heights with only a 5 minute walk to a fishing dock. OPTIONAL FULL INTERIOR DESIGN PACKAGE AVAILABLE! OPTIONAL FULLY DISTRIBUTED HIGH DEFINITION AUDIO/VISUAL PACKAGE AVAILABLE! Interested in custom designing your own dream home in Nusajaya? Check out the rest of this site for details!